Coyote Cash is a 5-reel slot online game that offers 25 paylines. The game features a somewhat unusual Wild West theme portrayed through a range of rough characters that will surely remind you of the Road Runner and Wily Coyote and then remind you of Wyatt Earp. The Coyote Cash Slot is compatible with several mobile devices and apparently, it is the best Windows mobile slots for fun games in the industry. In the Coyote Cash slot online, the star character is Wily Coyote himself, who is running from the law. The game is set on a dusty desert road, and the reel images include various suitable symbols including the American Eagle Sheriff who is in Coyote’s hot pursuit, a Cactus, an armored van, the sly Rattlesnake, a Bull Skull, and poker card symbols that seem to be nailed together in a sloppy manner on a piece of wood. To discover whether Wily Coyote is willing to share the stolen loot with you, just spin the reel. Since this is a pretty traditional casino game, you will not be confused about how slots work like you could be if you were playing the latest advanced and complicated slot machines. 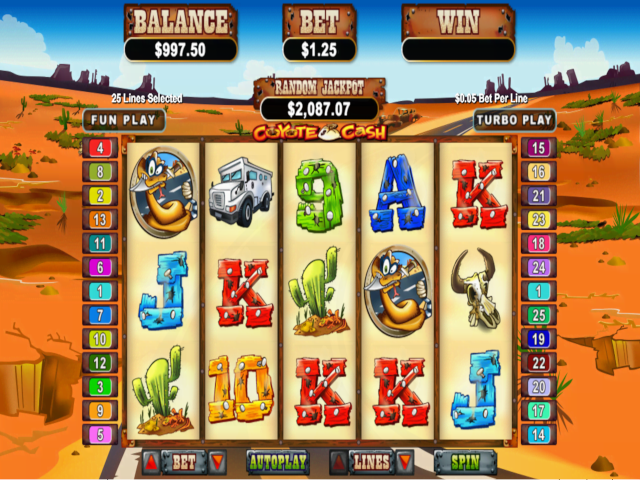 Coyote Cash slot online game features the Coyote as the Wild, which substitutes for all symbols apart from the Scattered Loot icon. Interestingly, though the Coyote is not shifting wild symbol, it can show up on all the five reels. If a Coyote or more win a combination, all the wins for that particular pay will be doubled. Lining up five Coyote symbols on a triggered payline with a maximum bet spin will give that line bet a 10,000x multiplier. The Coyote Cash slot for fun also features a progressive jackpot that is randomly activated at the end of any spin and pays out the prevailing jackpot value that is shown in real time on the top of the reels. If you line up three or more green Loot bag scatter signs on any place on the reels, you will activate 20 free spins. The free spins wins will be multiplied by 2, 3, or 4 according to the number of activating Loot bags 3, 4, or 5 respectively. Moreover, you can get more free spins via retrigger when at least 3 scatter icons show up atop the reels again during the free spins, and the first multiplier will apply on any wins you incur during the retriggered free spins. Although many find the Coyote Cash slot graphics to be a bit tacky and cheesy, the game actually matches other RTG-developed slots that offering a progressive jackpot, standard features, and free spins with pleasant payouts.